Covering the chalk plains and hills of eastern Frence, between Paris and Lorraine, Champagne is home to the most famous sparkling wines in the world. Champagne, lying to the east of the Paris region, is one of the great historic provinces of France. As far back as the times of the Emperor Charlemagne, in the ninth century, Champagne was one of the great regions of Europe, a rich agricultural area that was famous for its fairs. Today, thanks to a type of sparkling wine to which the region has given its name, the word Champagne is known worldwide – even if many of those who know the drink do not know exactly where it comes from. Champagne, that most delightful of sparkling wines, was not actually invented in the region. According to legend, it was monks who bought the method for making sparkling wine up from the Languedoc, in the south of France; but they soon discovered that the chalky soil and climatic conditions in the Champagne region produced a bright bubbly wine that was in many people's opinion better than the sparkling wines produced further south. There was of course more to the story of champagne than that; commercial success over the centuries had as much to do with the fact that the Champagne region was close to Paris and other great European cities, as with the inherent qualities of the product. But there is no region in France - perhaps no other region in the world - whose name has been made so famous by a local product. The modern region of Champagne-Ardenne, capital Châlons en Champagne, is not however one of the most prosperous of French regions; indeed, in terms of GDP, it is 17th out of the 21 regions of continental France - though 8th in terms of GDP per inhabitant. The difference is explained by the fact that in spite of bordering on the Paris region, Champagne is a relatively sparsely populated region - forming the north eastern end of what geographers have called the "empty diagonal" of France. Curiously, the capital Châlons is by no means the main city in the Champagne-Ardenne region; this honour goes to the former capital Reims (often spelt Rheims in English), one of the great historic cities of northern France, and four times the size of Châlons. The Champagne-Ardenne region consists of four departments - the Ardennes (08), the Aube (10), the Marne (51) and the Haute-Marne (52). The region is bordered by Belgium in the north, by Lorraine in the east, by Franche-Comté and Burgundy in the south, and by the Paris region and Picardy in the west. The region is made up essentially of areas of relatively flat agricultural land and areas of gently undulating hills. The hills are higher and more pronounced in the north of the region - the area of the Ardennes - and the south of the region, an area known as the Plateau de Langres. The central part of Champagne is an important agricultural area, with vast expanses of cereal production, and – in particular north of Reims – production of vegetables and sugar beet. In the north of the Ardennes department, the landscape is characterised by wooded hills and valleys. 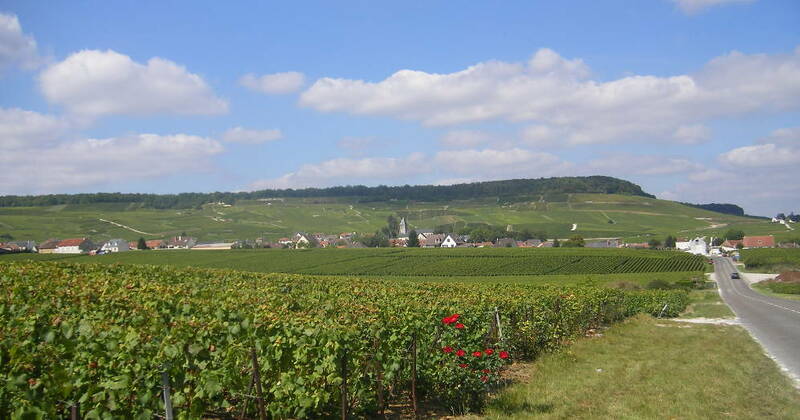 The famous vineyards of Champagne lie on the chalky hills to the south west of Reims, and around the town of Epernay. Reims cathedral - photo Kessiye - cc. Apart from the former regional capital Reims, the Champagne region is not a particularly busy tourist destination. Its rurality, accessibility and low population density have attracted a number of second-home owners from the Paris region and from Belgium and Holland - particularly in the hillier areas; but more often than not, it is a region that tourists pass through, rather than a destination. Lying on the main autoroutes from Paris to Germany and from the UK or Belgium to the south of France, Reims, a university city, has all the feel of a bustling regional capital; the old city is dominated by the 13th century cathedral, one of the great gothic cathedrals of northern France, and a UNESCO world heritage site. Badly damaged in the first world war (see WW1 sites and map), the cathedral has been painstakingly restored to its true glory. 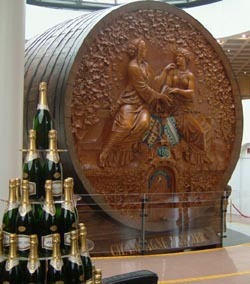 The city is also home to some of the major Champagne producers, such as Taittinger, and cellar tours are available. 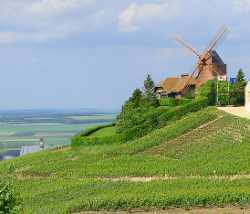 However, for perhaps the most enjoyable cellar visits and champagne tasting, many visitors will prefer to visit the smaller town of Epernay, fifteen miles south of Reims. Lying in the heart of "champagne country", Epernay is home to many of the most famous champagne producers, including Moët & Chandon or Perrier-Jouët. The town being small, it is easy to visit a number of champagne houses or cellars on foot. Finally, there is another small area producing champagne, which is quite distinct from the Reims-Epernay vineyard. 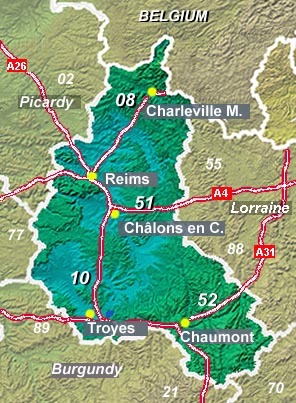 The southern champagne vineyard area lies in the Aube department, between the towns of Bar sur Aube and Les Riceys. Among the many historic sites in France that are less known than they ought to be, the small hill town of Langres, in the south of the region, must be near the top of the list. Sometimes referred to as the "Carcassonne of the North", the old town is a remarkable ensemble of historic stone buildings, enclosed within 3.6 kilometres of ramparts, mostly dating from the 13th and 17th centuries. 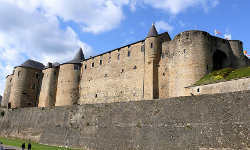 But parts are much older, as Langres has been a fortified city since Roman times; and unlike Carcassonne, Langres is not jam-packed with tourists. The Champagne region prides itself on historic links with some of the most iconic leaders that France has ever had - and in particular Joan of Arc (Jeanne d'Arc), who came from the village of Domrémy, now in the Aude department, and General de Gaulle, who is buried at Colombey les Deux Eglises, in the Haute Marne. Contrary to false information repeated on several websites, de Gaulle was not born here, and had no ancestral link to the region. Champagne cellars visits (51): at Rheims and at Epernay. Travel underground and see how the precious product is matured. Charleville Mézières (08): capital of the Ardennes department, birthplace of the poet Rimbaud. Old town. Colombey les Deux Eglises . village with the country residence of General de Gaulle, who is buried here. Epernay: the "champagne capital", small town in the hills south of Reims, with many of the biggest champagne producers. Cellar tours, champagne tours. 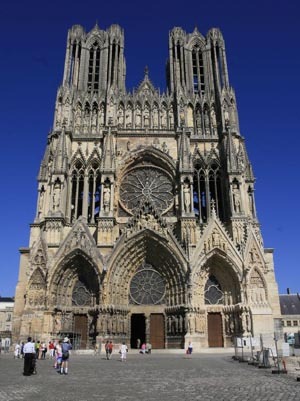 Reims: one of the finest medieval cathedrals in France. Once the kings of France were crowned here. Historic city centre. Basilique St. Rémi, Roman triumphal arch, Champagne cellar visits. Regional natural parks (51): the Montagne de Reims, hills south of Reims; the forêt d'Orient, near Troyes. River tourism: the Seine, the Marne, the Aube and various canals. 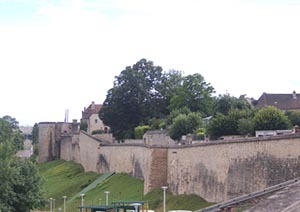 Sedan, Château-fort (08) - purportedly the biggest ancient fortress in Europe, built in the early fifteenth century. Troyes (10): 13th century gothic cathedral with fine stained glass; historic city centre. A small hand-picked selection of hotels in the Champagne region. Click hotel name for more details, with online booking and best rates. For full lists of Champagne hotels, see below. 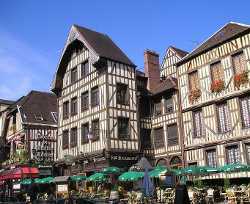 About-France.com takes the hassle out of finding a good hotel; we have read hundreds of hotel reviews on different websites, excluded hundreds of hotels from our listings, and only kept those for which the favourable or very favourable reviews well outnumber the poor write-ups. As a result, our hotel lists are short and very selective. Naturally, the type and quality of service provided will vary according to the type of hotel chosen; visitors cannot expect the same service or room quality in a two-star hotel as in a four-star chateau hotel. Our choice lists hotels that are generally judged to be above average or well above average for their category. See our selection of Paris hotels. The former region of Champagne-Ardenne, lying in the northeast of France between Paris and Belgium. is the now the northern part of a larger region known as Grand-Est. 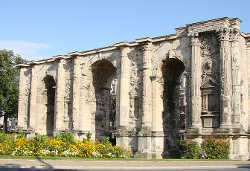 The capital of the Champagne area is Châlons en Champagne. Known worldwide for its sparkling wine, the region can be easily reached thanks to good road and rail connections. The Grand Est region also includes Lorraine and Alsace. Day trips to Champagne, from Paris, by coach or minibus, are available and can be booked online from Paris City Vision. Sedan, the fortress Photo Mossot - c.c. Language note: in French, the Champagne region is called " la Champagne", the sparkling wine is "le champagne".